German lithographer, illustrator, decorative artist and painter. He was the son of the painter and printmaker Ludwig Neureuther (d. 1832), and began his studies in Munich in 1823. His tutors included Peter von Cornelius, who enlisted him and several other young painters to help decorate the Glyptothek, and Wilhelm von Kobell. In 1830, fired with enthusiasm for the July Revolution in France, Neureuther went to Paris. He produced numerous studies from life (Munich, Staatliche. Graphische Sammlung), which are among his best works. From 1836-37 he was in Rome. 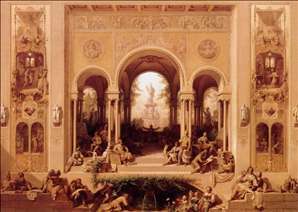 From 1848 to 1856 he ran the Nymphenburg Porzellanmanufaktur, and for ten years from 1868 he taught decorative mural painting at the Munich Kunstgewerbeschule. Neureuthers principal importance lay in the field of book illustration. His reputation was established with the Vignettes for Goethes Ballads and Romances (Randzeichnungen zu Goethes Balladen und Romanzen), published by J. G. Cotta in five booklets of 46 lithographic contour drawings in Munich, Stuttgart and Tbingen between 1829 and 1839. Goethe, to whom Cornelius had mentioned Neureuther, repeatedly spoke of these works in public, realizing their similarity to the prayer book of the Emperor Maximilian illustrated by Albrecht Drer, Lukas Cranach the Elder, Hans Baldung, Albrecht Altdorfer and others. A new edition of this work, with lithographs by August Strixner (b. 1820) had appeared in 1808. Neureuther later illustrated many other texts, but his approach became increasingly naturalistic and picturesque, and there was a notable decline in the artistic standard of the work. See more details about "The Arts Flourishing in Munich"